Suzanne's Tribe: Not much Monday Crafting! 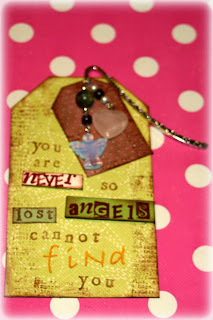 It's a tag for a friend, the intention is to make a few more with other quotes on - and I'm thinking Chakra related .... Don't for one minute think I didn't hear the collective sigh on my alternative therapy ramblings!........ and a bookmark, but I used specific gemstones for angels and healing ..... I know, I know, there I go again! Pleased you had a good week-end. I'm sure things will improve not need to hang your head in shame. I think chakra stuff is cool! Love the tag! Sounds like a good weekend :).